Feels like spring everywhere but Batawa. Despite the lack of snow and warmer weather this winter in the Quinte region, Batawa Ski Hill has been keeping its hills freshly white. 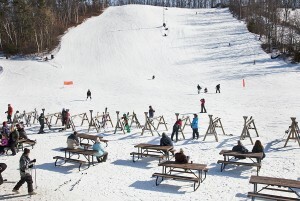 “It’s certainly been a very mild winter this year, but we’ve kept busy at the hill and have been doing fairly well,” said Stephanie Adams, administration supervisor at Batawa Ski Hill. The staff at Batawa have had a fairly busy winter despite what people outside the hill would think, taking advantage of the nights when the temperature would drop back down to -5°C to produce as much machine-made snow as possible. “We’ve definitely had to produce a lot more fake snow than we would have liked due to the weather. It’s been more expensive financially for us than last year to produce the snow, as opposed to having well­­ – free snow,” said Adams, laughing. “We do have snow which is hard to believe for a lot of people. Everyone outside the hill gets to see green and yellow patches of grass, but I sit here and look out my window and the hill is just completely white,” said Adams. Frost Fest took place at Batawa the following weekend, Feb. 3 and 4, and the ski hill had a really good turnout, said Adams. All of the planned events were open, with a good amount of snow, and the park was filled with smiling faces after a weekend of mild weather and sunshine. “Word of mouth has definitely been the key to spreading the word about the hill being in perfect condition to ski,” said Adams. All events have gone as planned this year for the hill. The season isn’t over yet, with more events planned for the next few weeks, some whether there is snow or not. “We’ve only had to close the hill one day all year, and that was a morning when it was plus 10 degrees outside and raining, but other than that, we’ve had a fairly successful year for the hill,” said Adams. With Family Day coming up and the March break, the staff at Batawa say they are looking forward to all of the skiers and snowboarders. “It’s definitely been a successful year, thanks to the staff for stepping up to the plate and really helping produce the fake snow and with maintaining the hill for our skiers,” said Adams.